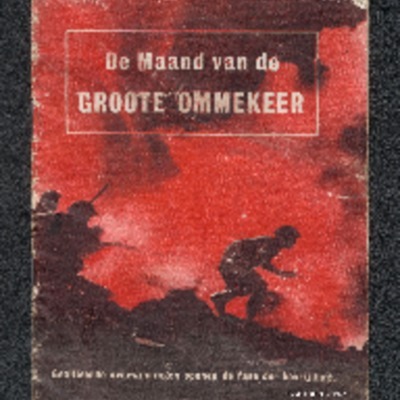 Propaganda leaflet issued by Supreme Headquarters Allied Expeditionary Forces to the people of occupied Holland, advising and instructing them on how to deal with relief food drops. Original in Dutch and English translation. 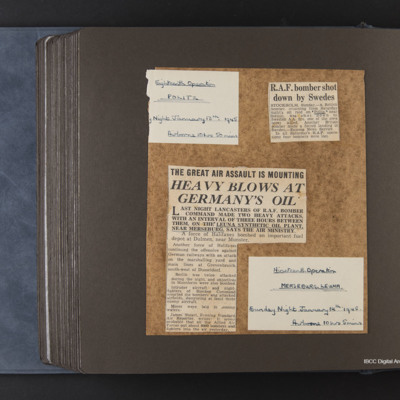 Contents include Dutch royal birth, bombing of the Philips factory in Eindhoven, messages from royal family and commanders, and an overview of the war situation in Europe. 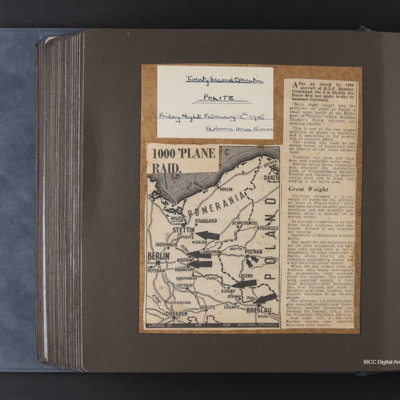 Covers events in 1941 and 1942 describes allied successes as the month of the great turnaround. Includes Russian front, El Alamein, Operation Torch, naval operations, Japanese setbacks and allied war leaders. 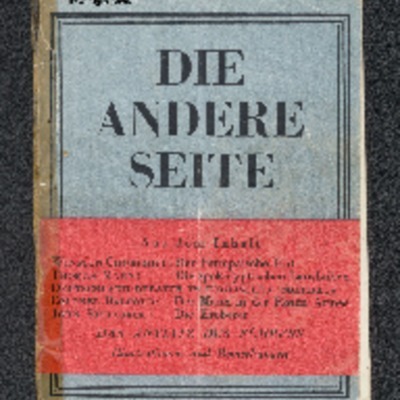 Propaganda booklet with illustrated articles on the current war situation as seen from the Allies' perspective. Authors include Winston Churchill, Henry Wallace, the archbishop of Canterbury, Richard Hillary and John Steinbeck. 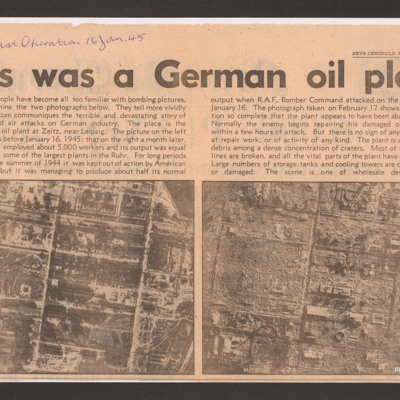 Shows the effects of an operation that destroyed the synthetic oil plant at Zeitz. Captioned 'My last operation 16 Jan. 45'. 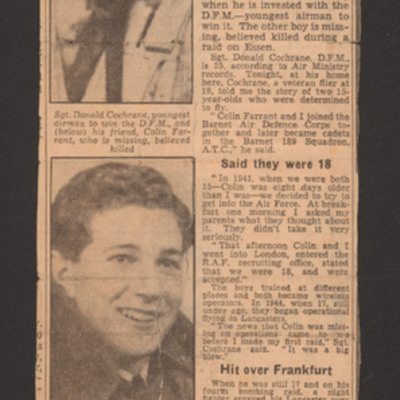 A handwritten note giving brief details of the operation and a relevant newspaper cutting titled 'Today I took wine with an officer of the British Commando Brigade in the garden of a ruined house in Wesel'. 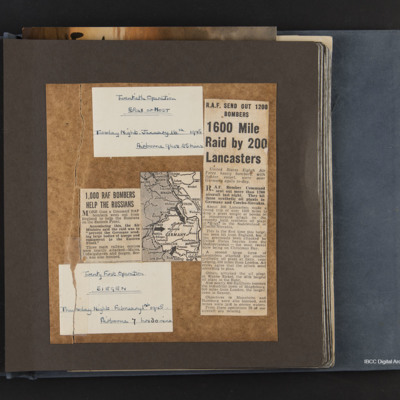 Two handwritten notes giving brief details of operations and relevant newspaper cuttings titled 'Packed Nazi troop towns hit' and 'RAF keep it up'. 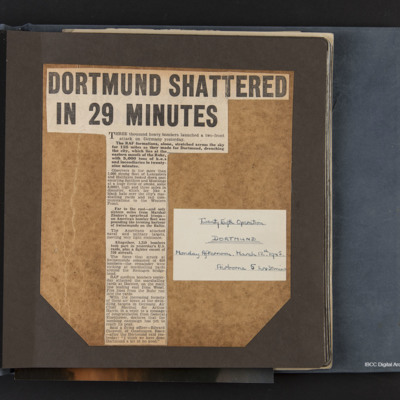 A handwritten note giving brief details of the operation and a relevant newspaper cutting titled 'Dortmund shattered in 29 minutes'. 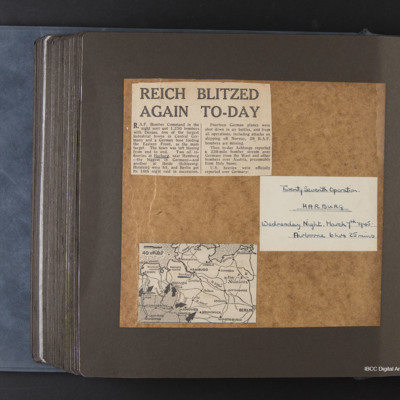 A handwritten note giving brief details of the operation, with a relevant newspaper cuttings titled 'Reich blitzed again to-day' and one map. 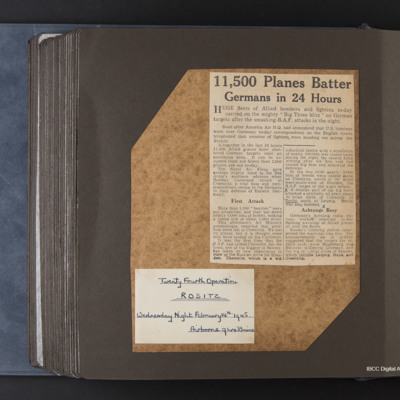 A handwritten note giving brief details of the operation and a relevant newspaper cutting titled '11,500 planes batter Germans in 24 hours'. 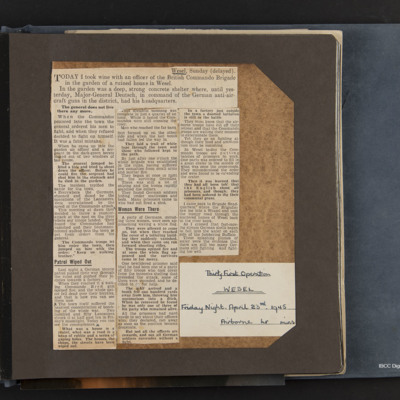 Handwritten note giving brief details of the operation and a relevant newspaper cutting titled 'Dresden. 2,000-ton double RAF blow'. 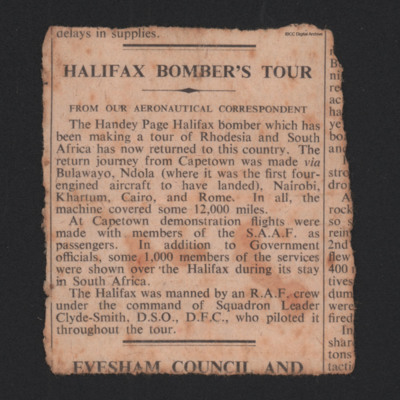 Handwritten note giving brief details of the operation with a relevant newspaper cutting titled '1000 'plane raid' and one map. Handwritten notes giving brief description of the operations, two relevant newspaper clippings titled 'R.A.F send out 1200 bombers. 1600 mile raid by 200 Lancasters' and '1,000 RAF bombers help the Russians'. relevant newspaper cuttings titled 'R.A.F. bomber shot down by Swedes' and 'The great air assault is mounting. Heavy blows at Germany's oil'. A handwritten note giving a brief description of the operation and a relevant newspaper cutting titled '3,200 planes hit Reich'. A handwritten note giving brief details of the operation and a relevant newspaper cutting titled 'American Take Saarlauten and push on beyond. R.A.F. 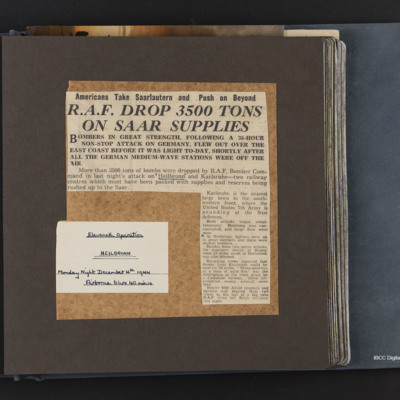 drop 3500 tons on Saar supplies'. 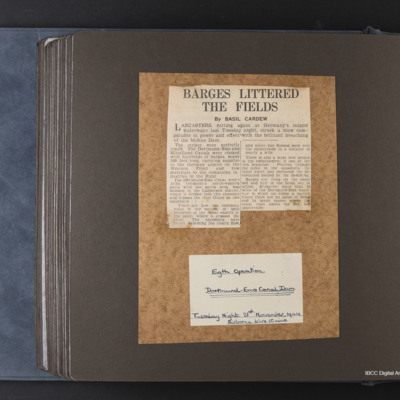 Handwritten note giving brief details of the operation and a relevant newspaper cutting titled 'Barges littered the fields'. Handwritten note with brief details of the operation. 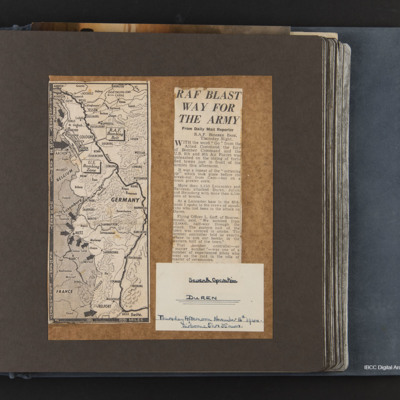 Two newspaper cuttings, one describing the operation titled 'RAF blast way for the army' and a map showing the area of operations.